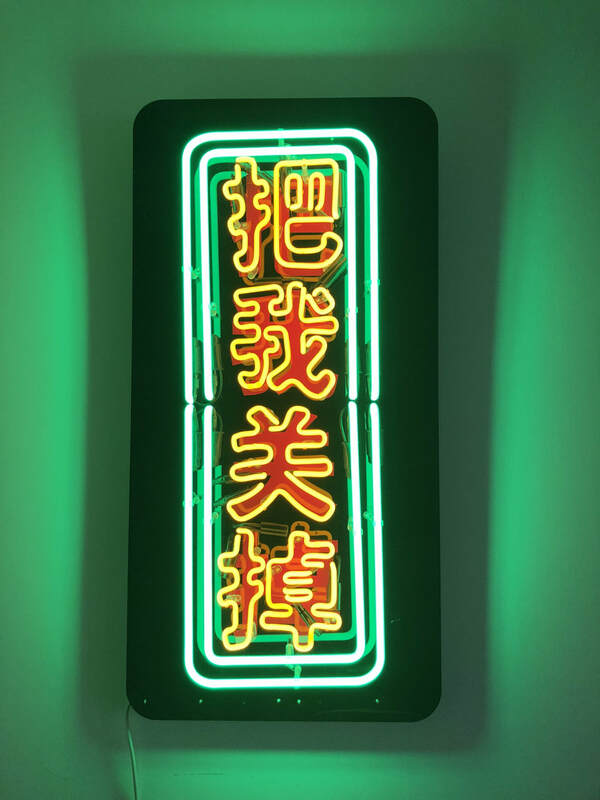 "Switch me off" is a paradoxal artwork as being switched on is peculiar to a neon light. There is not only a paradoxal idea in this artwork. It also blows the whistle on light pollution. Even though Hong Kong and Asian cities can be proud of their architectural lighting, yet some of their people have started fighting the scourge. Chosing a neon for this message is also a way to draw attention to the rapid disappearance of those icons of the city culture in the era of LED lights. In a way, the vintage-like neon speaks as an old wise man asking for more care for the environment and people's health. The glass tubing is twisted and turned at very high temperatures heated by gas heaters. Wu attaches a rubber tube to the glass tubing and blows into it periodically so that the curved area keeps its shape and doesn’t cave in. Once it has been manipulated into the right shape, electrodes are installed in each end. Air extraction equipment is then used to create a vacuum which removes air and impurities from the glass tubes. Once that’s done, either neon or argon gas is pumped in to create the colours – neon for red, argon for blue. Other colours are made by using different coloured glass tubes, while powder can be added to make, say, a red light turn pink.